A buck struggles with Christmas lights tangled in its antlers. Colorado Parks and Wildlife is reminding people to keep wildlife in mind with their outdoor decorations. While holiday lights brighten the short days of early winter, Colorado Parks and Wildlife reminds residents to hang outdoor decorations with wildlife in mind, according to a news release from the agency. Every year, CPW receives reports and photos of bucks snarled in decorations. 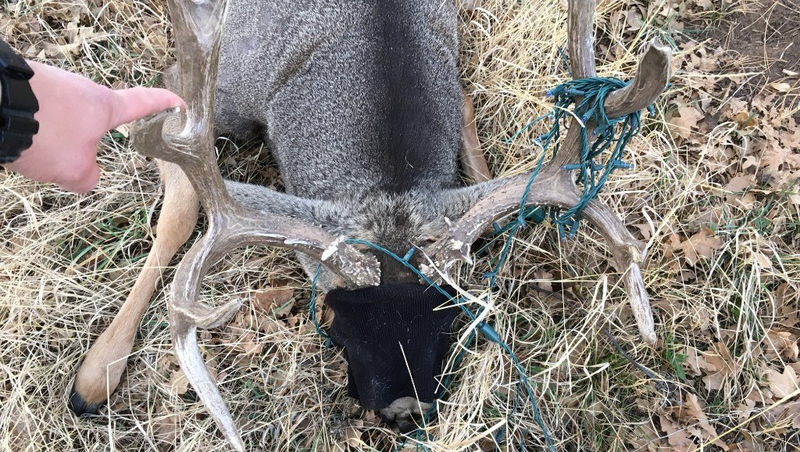 In Salida recently, a buck became tangled in a rope being used as part of an outdoor display. CPW officers and staff from the Salida Fire Department helped cut it loose, but the deer is still dragging around some rope. Deer are entering their mating season, and bucks are moving around with only one thing on their mind: finding a mate. To prevent animals from becoming snared, CPW suggests decorations be wrapped tightly around posts and trees. Lights that are hanging should be at least six feet off the ground for the entire length and fastened securely at the ends. Lights should not be draped over bushes or trees, and decorations attached to a house or building should be secured tightly. CPW also suggests putting away other items bucks can become tangled in, such as volleyball nets, tricycles, wire items used for gardening, garden tools, hammocks, and swings. Those who sees a buck that has become snared in decorations or some other item are asked call the nearest CPW office. A wildlife officer will attempt to find the animal and make a determination if it is in a life-threatening situation. For office locations and phone numbers, visit cpw.state.co.us/aboutus/pages/contactus.aspx.